Hello again from 2016!!!! I hope you’re ready to knock 2016 out of the park! Those of you who have been around here for a while know that each month myself, and a whole slew of other bloggers get together and do a Monthly DIY Challenge. Each month we choose an item or a theme and all do something different with it. 2015 was a great year for our challenge so we wanted to share or Best of 2015 Monthly DIY Challenge posts. Enjoy and be sure to PIN & SHARE if you love something! We’ve spiced things up a little today. You can link up YOUR best of 2015 posts at the bottom of this post. We can’t wait to see all of the fun projects! Also, for a fun little spoiler, next month’s theme is “Metallic”!! I can’t wait to see what everyone comes up with. Houseologie’s top Monthly DIY Challenge post was The Great Crate Challenge. We all started with a basic, raw wood crate and worked our magic. I made campaign style shoe storage that is still working overtime in my little entry closet! Dwell Beautiful – She made a gorgeous curtain canopy over her bed using PLUMBING parts. Genius and so Gorgeous! Little Red Brick House – She made a Window Pane Mirror using Dollar Store Mirrors. It turned out stunning!! 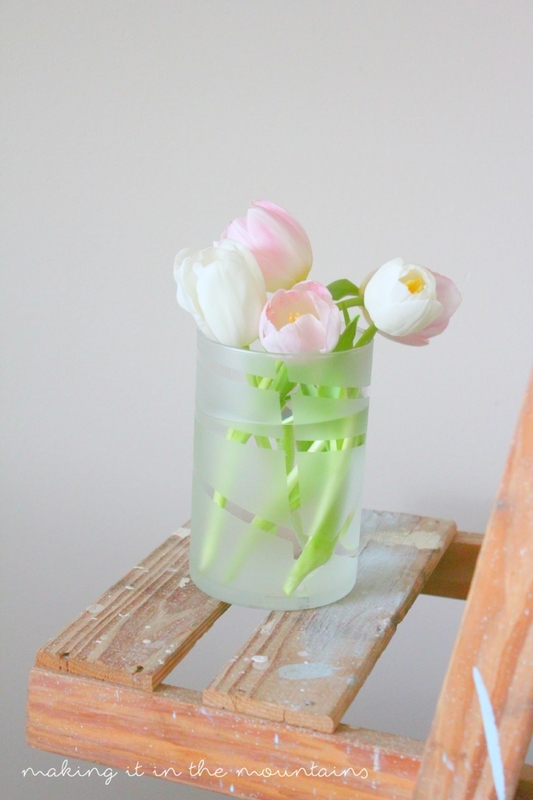 Making It In The Mountains – Kristi made these gorgeous frosted vases, also from the Dollar Store. So pretty and so inexpensive to make!! 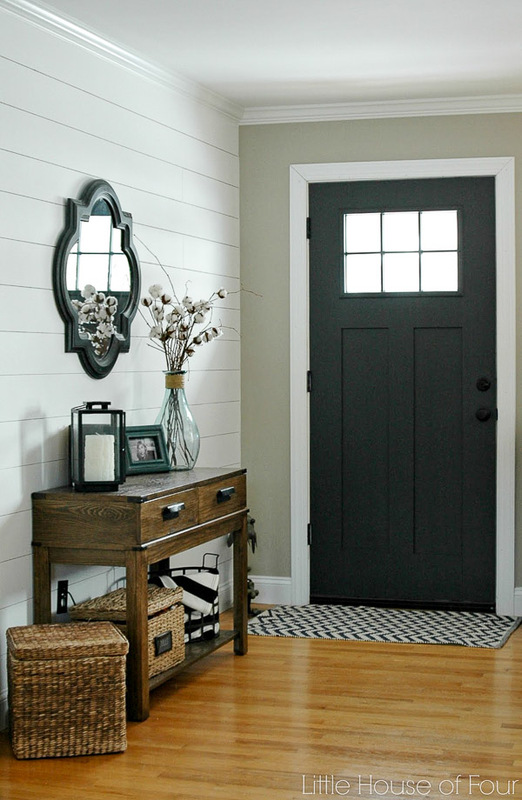 Little House of Four – For the paint challenge Katie painted her front door Iron Ore and let me tell you it so beautiful!! DIY Passion – Erin also hit it out of the park with her paint post for July’s Monthly DIY Challenge. She made these end tables match by painting them and they turned out perfect! Canary Street – For the Cork challenge Amy & Vicki made a fabric covered bulletin. Simple and easy, turned out so nice!! 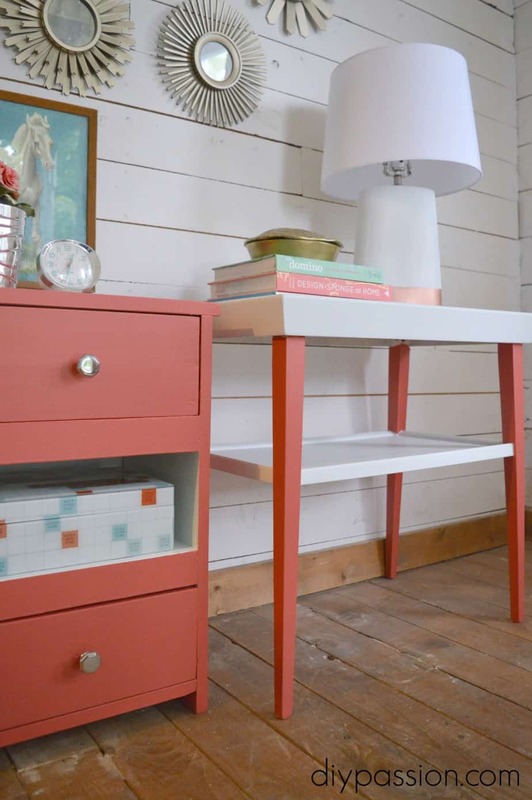 Brepurposed – Bre built this amazing PVC Pipe table and holy moly it stole my heart. She did a great job!! Meet the B’s – Nicole painted a wicker basket and it looks so much more updated and finished. Paint can really work wonders!! 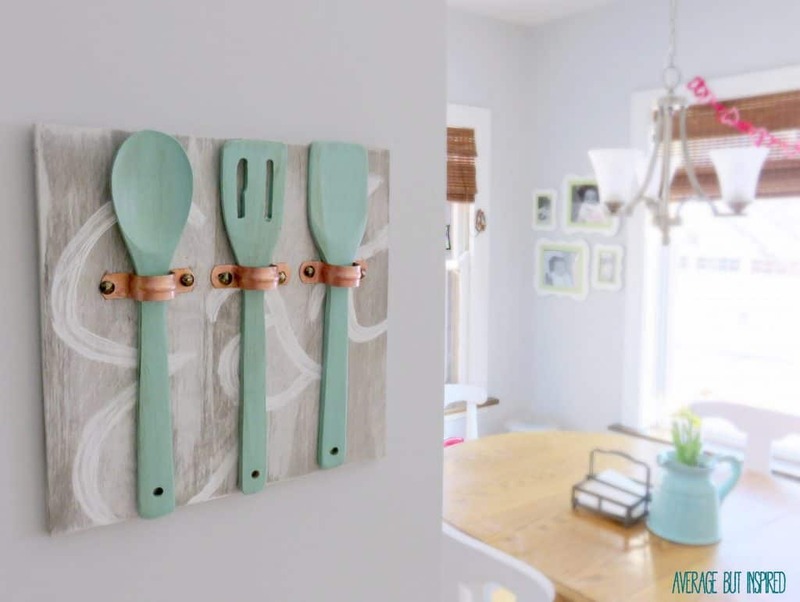 Bre from Average But Inspired made this adorable Kitchen Art, using plumbing pieces and wood utensils. So cute, right?! 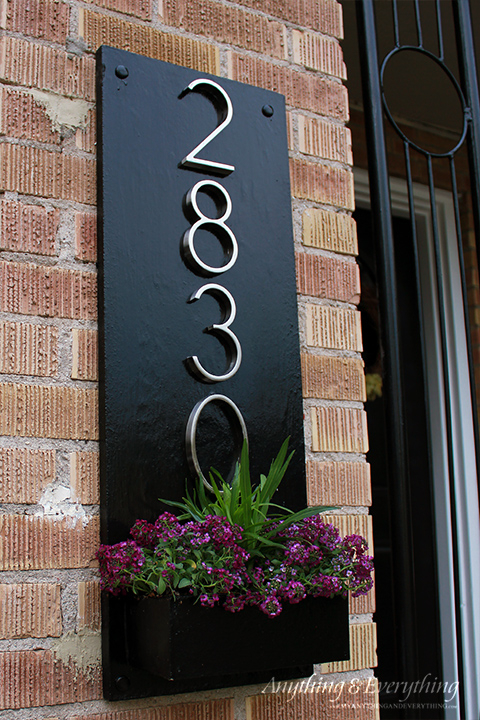 I totally swooned over this DIY Address Plaque from Anything & Everything. It has the perfect mid-century minimal vibe going on. We’ve all really enjoyed working on these projects and are so looking forward to the ones we have planned for 2016! Now it’s time for you to link up your best of 2015 projects. I’m so excited to see what you share with us! !